We can breath again. Scotland said no to independence. Great Britain lives on. The United Kingdom is intact. We can forget all those arguments about a currency union and sterlingisation. We are truly better together. Here are my thoughts on the day we found out that the 307 year old union has been renewed. Scotland and Britain will never be the same again. Out of touch London politicians have had the fright of their lives. Cameron, Miliband and Clegg complacently assumed that the result was a foregone conclusion. But when a single poll claimed a yes lead, they panicked. They cobbled together a promise of ‘Devo Max’ – home rule within the UK. Dave, Ed and Nick rushed up to Scotland to declare undying love for the country and plead with Scots not to file for divorce. It was desperate and unconvincing. I suspect the fact that the separatists couldn’t say what currency an independent Scotland would use or whether it would be in the EU had far more impact. The result was not too close to call. But Alex Salmond and the yes campaign achieved something extraordinary. Almost 45 per cent of the Scottish electorate voted to leave the UK. 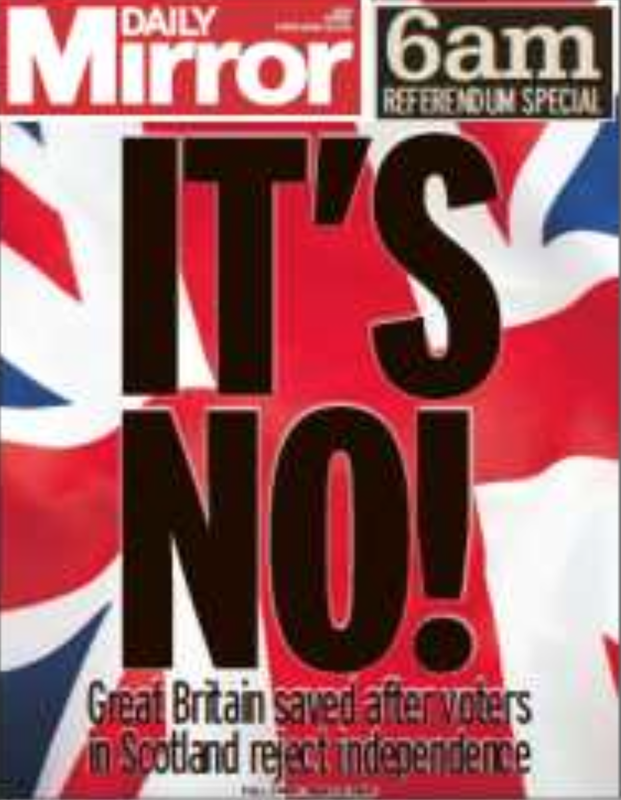 Britain’s third largest city rejected the union. That’s a terrible indictment of the way Britain has been run. If things don’t change, we could well see the breakup of Britain by 2040 – a century on from the Battle of Britain. The Guardian’s Ian Jack put it beautifully, as always, in a column explaining why he, a supporter of the union, was glad Scotland gave Britain a fright. Most people agree that the referendum campaign has been an amazing exercise in democracy. Some 85 per cent of the electorate voted – the highest ever poll in Britain. (The highest ever general election turnout was 83.9 in 1950.) The campaign saw people across Scotland’s cities, highlands and islands passionately debating the country’s future. There has been much talk about the failure of the Westminster elite. As I blogged last week, Britain was once one of the best governed countries on earth. No one could make that claim now after decades of policy and administrative disasters ranging from the poll tax to the Iraq war. Too many people think all politicians and parties are the same: quick to promise, quick to break those promises. The referendum offered two totally contrasting options for Scotland’s future. Britain hasn’t had such a stark choice since 1983. Did Gordon Brown save the union? His premiership was a sad footnote to Labour’s 13 years in power. But Gordon Brown played a huge role in saving the union yesterday. He brought gravity to the campaign – and people listened as he remains hugely respected in his home nation. He should have been involved from the beginning. Gordon Brown could be back in power as Scotland’s first minister within five years. Britain’s constitution is famously unwritten. Constitutional change happens at a glacial pace: the House of Lords remains unelected over 100 years after the Parliament Act reduced the upper house’s powers. Devolution to Scotland and Wales took decades. Yet the prime minister promises legislation for home rule all round in months. How can this possibly happen? It’s a classic example of a politician making an impossible promise. We need time to get a sensible UK-wide settlement. And that must involve the people, not just the deeply discredited political elite. It’s time to have a constitutional convention along the lines of Scotland’s convention that paved the way for the return of a Scottish parliament in 1999. That can’t happen in a few months. We need an enduring settlement, not a quick fix. Alex Salmond quit as Scotland’s first minister hours after the result. He seemed crushed by the defeat of his dream. Yet his achievement is incredible. To come within 10 percentage points of victory was remarkable, as was leading the SNP into majority government in Holyrood. He can be infuriating and slippery. (He was completely unconvincing on the currency union question.) But he has been the most influential British politician of the past decade. I suspect we haven’t seen the last of Alex. People once talked about the Irish question. In the 1970s, Labour’s Tam Dalyell raised the West Lothian question: why should he, as that constituency’s MP, vote on policies affecting England when English MPs would have no say on Scottish policy that would be devolved to Scotland? He raised it in the run up to the 1979 referendums on Scottish and Welsh assemblies. Those polls fell short, but 20 years later Scotland, Wales and Northern Ireland won devolution. Now, people are talking about the English question. In short, the English are impatient. They don’t see why the Scots, The Welsh and Northern Irish should get all the attention. Yet the English equally seem unenthusiastic about any of the options open to them. They rejected regional assemblies. And they seem equally unenthusiastic about an English parliament. It’s hard to see Cameron & Co coming up with a solution in the next few months. (I’m reminding of the late Willie Whitelaw accusing Labour of stirring up apathy…) Perhaps the answer is to have England MPs voting on matters that affect only England – I see no problem having MPs for English constituencies sitting as an English parliament in this way. The union is safe – for now. Scotland had the chance to go it alone and chose to stay as part of our family of nations and identities. Britain lives on. This entry was posted in Britain and tagged Scottish independence by Rob Skinner. Bookmark the permalink. I’m 4th generation Kiwi, but 9/16 Scots and 7/16 English – and I dreaded the thought of the Big Split. Last Thursday was indeed an exciting – and satisfactory! – day.